Today, the pace of change means your team has to work harder to keep abreast of the latest market developments – which can lead to 'information overload'. Not only do your people need high-quality news, insights and data – they also require the tools to give each team member exactly the right information at the right moment. FT.com is internationally recognised for its authoritative, award winning journalism, world-renowned, trusted reporting and expert analysis, giving businesses the information they need to make more informed decisions. An FT Group Subscription gives your team unlimited access to our real-time news and insight – integrated into your everyday workflow and tailored to the topics, markets and geographies that are most important to your business. So you and your colleagues will always have the FT edge. We put the news into context by combining it with expert market analysis – so your team has a fuller picture on market trends and issues likely to impact your business. Our data-driven insights empower your team to make more informed business decisions – by exposing risks and highlighting opportunities. Keep your clients informed and advise them with confidence – when your team has access to the most reliable news and insights from a source you can trust. 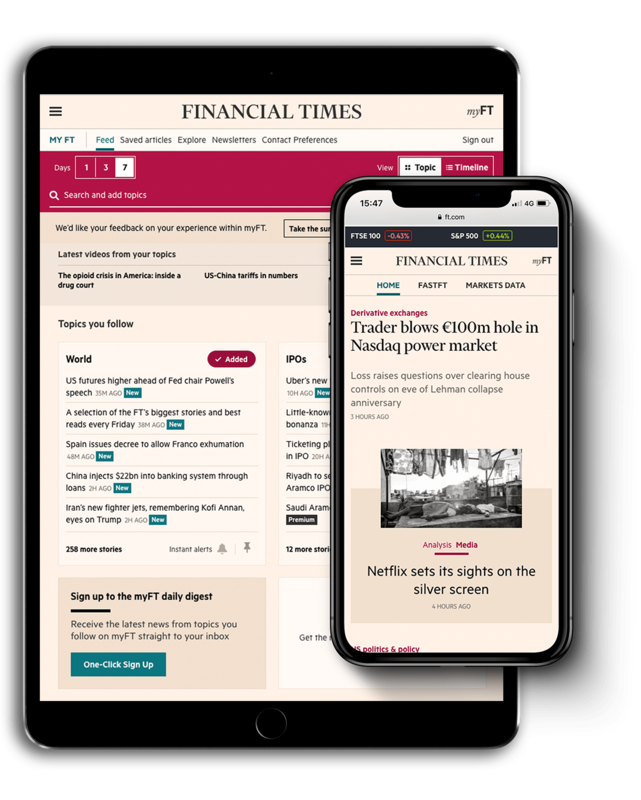 Your personalised FT news-feeds can be accessed across multiple devices, via third-party platforms (such as Bloomberg and FactSet) and integrated into your own existing workflows. 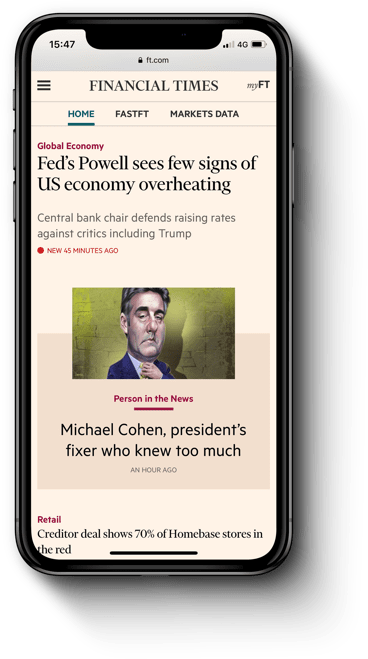 The FT brings you first-class reporting and award-winning analysis, from a truly global business perspective – delivered to any device you choose, 24/7. An FT Group Subscription can give your team, department or entire organisation the expert insight to optimise business decision-making in real-time. Critical market analysis can be integrated into existing workflows and delivered through personalised newsfeeds, giving teams and individuals streamlined access to the content most critical for them. Join more than 4,000 organisations worldwide using the FT’s unmatched journalism and analysis to stay ahead of the competition, advise clients with confidence and achieve objectives. Your FT Group Subscription gives your team full access to all FT global news, plus premium in-depth analysis and email briefings. FT.com is fully responsive for mobile access, and we also provide apps for iOS and Android devices. Our simple, secure, easy-to-use platform enables your team administrator to manage users, set up and manage groups, and select topics for them to follow. It also provides valuable insight into how your team members are accessing and using FT content, so you can manage your subscription effectively. With an FT Group Subscription, your organisation only pays for the team members who regularly need access to our content. We work with you to identify the number of people that will require frequent access. We also offer volume discounts for our group users. FT.com is one of the fastest news sites in the world, and you can tailor it to suit your team’s interests by ‘following’ particular topics. For example, you can track mentions of your clients or competitors to keep you and your team one step ahead. Our customer success managers apply their expertise to help your team realise the full value of our services. We start by agreeing a plan to embed FT content within your business and drive user adoption, plus we provide training to ensure you get the maximum benefit for your team. Easily integrate your personalised FT newsfeeds into your existing workflow solutions and applications. It can also be accessed via over 60 third-party platforms, such as Bloomberg. Try out our Group Subscription for 30 days and gain unlimited access to FT.com at no cost. Simply provide your details, and our team will contact you to activate your free trial.